[S47] UK National Census for 1861 for UK, "RG19/2596 f73 p19 84." [S59] Jean Barnes ed. All Saints Daresbury MI "R81." [S309] Burials, All Saints, Daresbury, Cheshire, 1813-1949 "p115/919 aged 55." [S4] Index to Marriages, unknown second location, pre-1837 "Edwards Thomas J. Ford Ann 9/2/1836 B El." [S40] UK National Census for 1851 for UK, "H.O.107/2164 f158a p15 52." [S37] Website Cheshire BMD (http://cheshirebmd.org.uk/) "DAR/2/5." [S309] Burials, All Saints, Daresbury, Cheshire, 1813-1949 "p105/835 aged 27." [S37] Website Cheshire BMD (http://cheshirebmd.org.uk/) "C12/3/222." [S37] Website Cheshire BMD (http://cheshirebmd.org.uk/) "RUN/23/77." [S309] Burials, All Saints, Daresbury, Cheshire, 1813-1949 "p73/578 infant." [S37] Website Cheshire BMD (http://cheshirebmd.org.uk/) "RUN/25/78." [S309] Burials, All Saints, Daresbury, Cheshire, 1813-1949 "p84/672 10 weeks." [S309] Burials, All Saints, Daresbury, Cheshire, 1813-1949 "p58/461 aged 84." [S309] Burials, All Saints, Daresbury, Cheshire, 1813-1949 "p8/60." [S59] Jean Barnes ed. All Saints Daresbury MI "D6." [S40] UK National Census for 1851 for UK, "H.O.107 2164 f188 65." [S309] Burials, All Saints, Daresbury, Cheshire, 1813-1949 "p105/837 aged 23." [S40] UK National Census for 1851 for UK, "HO 107/2164 f188 p18 65." [S37] Website Cheshire BMD (http://cheshirebmd.org.uk/) "C10/1/27." [S28] County Directory, 1850 "p584." [S309] Burials, All Saints, Daresbury, Cheshire, 1813-1949 "p71/561 William Broom Keckwick aged 51." 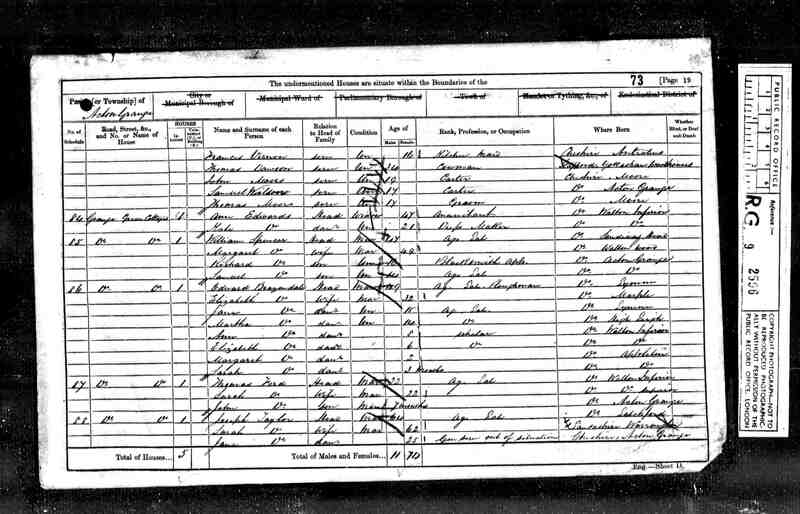 [S2] UK National Census for 1871 for UK, "RG10/3690 f30 p21 83/4." [S37] Website Cheshire BMD (http://cheshirebmd.org.uk/) "C19/1/215." [S171] Baptisms, All Saints, Daresbury, Cheshire, 1841-1868 "1026." [S171] Baptisms, All Saints, Daresbury, Cheshire, 1841-1868 "1078." [S309] Burials, All Saints, Daresbury, Cheshire, 1813-1949 "p158/1258 aged 33." [S37] Website Cheshire BMD (http://cheshirebmd.org.uk/) "RUN/3/29." [S309] Burials, All Saints, Daresbury, Cheshire, 1813-1949 "p185/1479." [S309] Burials, All Saints, Daresbury, Cheshire, 1813-1949 "p182/1451 Betsy Broome Denbigh 37 WH Spencer PC." [S37] Website Cheshire BMD (http://cheshirebmd.org.uk/) "DAR/8/37." [S309] Burials, All Saints, Daresbury, Cheshire, 1813-1949 "p108/860 aged 3m." [S309] Burials, All Saints, Daresbury, Cheshire, 1813-1949 "p120/956 aged 4m." [S309] Burials, All Saints, Daresbury, Cheshire, 1813-1949 "p182/1456 Betsy Broome Denbigh 4 WH Spencer PC." [S49] UK National Census for 1881 Index, UK "RG11 Piece 3709 Folio 79 Page 48." [S70] General Record Office Indexes "Dec 1860 Prescot 8B 798. [S70] General Record Office Indexes "Dec 1860 Prescot."